After such a great week together — where nothing was planned and everything turned out perfectly — it was hard to say good-bye to the Pritchards. We’re driving south and they’re heading back home to resume their normal life. Thankfully, nothing has to be normal for us ever again! It's been so much fun hanging out together! 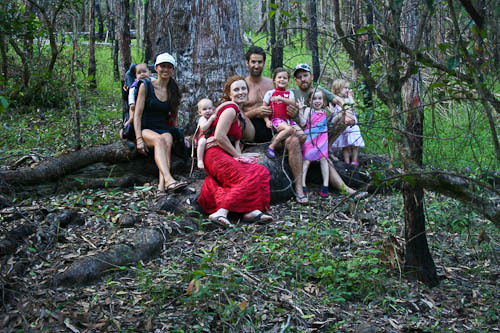 As we packed up our Cunglebung campsite, we met the landowner who was very surprised to find us camping in his paddock. He thought it was amazing that we had successfully gotten so far down the dirt track. After weeks of rain, our sunny days at Cunglebung meant that we enjoyed glorious weather and the track had dried out so we wouldn’t get bogged again! On the way out of Cunglebung, Sarah and Grace had a turn in the top of the truck with Jess and our girls. Our drive to Cunglebung had taken us in a large loop to the west of Grafton, and as we were driving right past Waterview Heights, we decided to return to Woodoo’s house for a quick swim before the final parting. It was lovely to cool off in Woodoo's pool after our drive out of the bush. 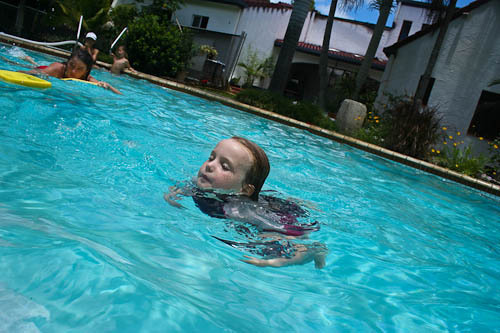 In the past week, Aisha has regained confidence as an independent swimmer. 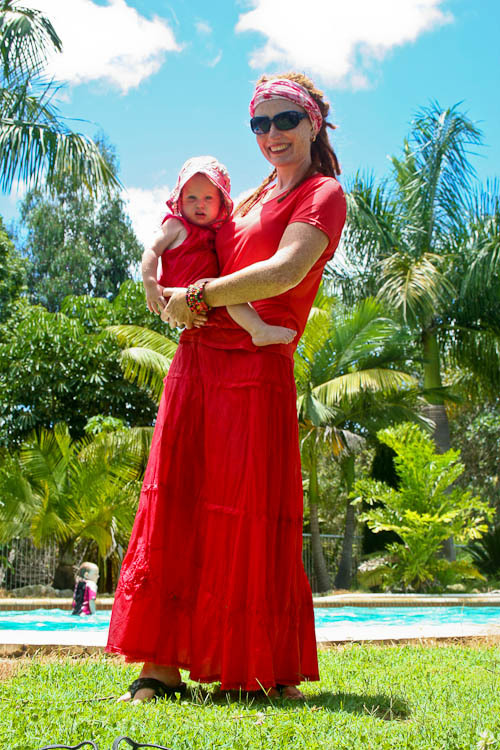 I found it easier to get into the pool with all my clothes on — they dried very quickly after I go out! We’re thankful for this time with the Pritchards. They have been such an encouragement to both of us. Their honesty, transparency, godliness and kindness have inspired us in immeasurable ways. We know that our Father will continue to bless them and their family as they continue to seek Him. As we drove away, David and I reflected a lot on their generosity. They have willingly fostered many high-needs children — providing respite on holidays and also taking permanent placements. In so many ways, I guard our family closely against outsiders. I wonder if the Father is bringing people like the Pritchards alongside us to demonstrate that we can open our hearts to more than just our blood relatives and thus discover a new depth of relationships — even tumultuous ones — that are blessed by Him. I pray that we are continually open to His guidance in our lives. It would be so boring if we stopped following God! 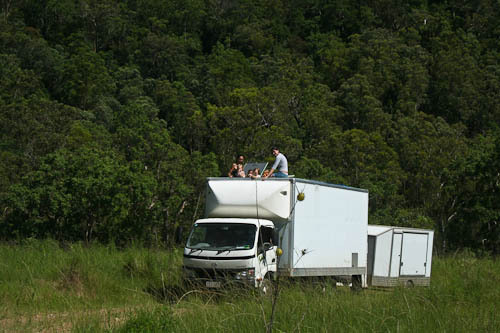 This afternoon, we’re driving this down to Coffs Harbour where a house awaits us. My extended family is very generous, and my auntie’s house on the beach is available for us. After days in the truck, I’m looking forward to some of the comforts of home, and I’m thankful for the location and the timing! It is such a wonderful idea to have a blog to follow your travels. This is what I want to do too – you lucky/blessed people. While you are in the area of Coffs Harbour, why not have a look at Sherwood Cliffs. 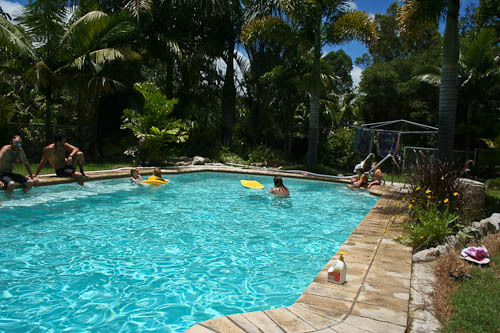 It is a wonderful drug rehab built totally on faith and the healings that God has done in and on that property is absolutely amazing.The Reiflers (the owners of Gods property) are connected with the Coffs Baptist Church. Its such an inspiration to see His work in action and a trip worth seeing. They are open to the public on a Saturdays. You can’t go in with even a Panadol. Look forward travelling with you. Probably an unusual comment coming from a guy, but I like that red dress, Lauren!